Before 1946, Americans were unable to sue the government due a doctrine referred to as sovereign immunity. That year, provisions were passed to allow citizens to be able to, essentially, sue the federal government in cases of personal injury. The statute is called the Federal Tort Claims Act (FTCA). Here is what you need to know about the act itself, the criteria that a claim must meet, and how the claims process works. Put simply, the cases where the FTCA applies are cases wherein a private party suffers an injury due to the actions or negligence of a U.S. government employee. There are specific guidelines that dictate what types of circumstances fall under the FTCA, which are further outlined below. When a private party suffers a personal injury as a result of negligence or actions of a U.S. government employee, the government itself assumes all liability, not the individual employee. The personal injury must have been caused by an official U.S. government employee (not a contractor). The federal employee in question must have been acting within the scope of his or her duties. The federal employee in question must have acted wrongfully or with negligence. The negligence or wrongfulness was the cause of the injury. There are a number of steps in the process of filing a personal injury lawsuit against the government. The first thing you should know is that a personal injury lawsuit under the FTCA must be filed with the department in which the employee works, so if the injury happened at a post office the claimant must file a claim with the U.S. Postal Service. The claim must be filed within two years of the injury, and when it is filed all of the facts, details, reports of damages, and documentation should be included. The agency then has six months to respond to the claim. If the agency agrees with the claim, they may settle right away without ever going to court, which is not uncommon. 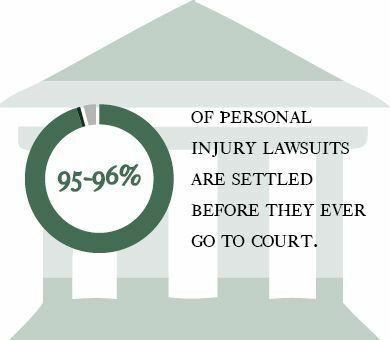 Ninety-five to 96% of personal injury lawsuits are settled before they ever go to court. If the agency denies the claim, however, the claimant has six months to officially file the lawsuit. Moving forward with the lawsuit might mean that it’s time to look for a lawyer for counsel and representation. If you find yourself filing a personal injury claim against the government under FTCA, look for personal injury lawyers who are experienced in that area of law.